As the disaster unfolds in Nepal, I think of my time at CARE Canada in terms of the challenges to overcome as humanitarians seek to bring life-saving and meaningful assistance to the communities in need of support. The limited resources of food, water and medicine have yet to reach everyone in need, and may never go as far as they are needed, being finite and consumed almost immediately. When I think of my work at Vancouver Foundation it is framed in terms of our vision – to build healthy, vibrant and livable communities throughout British Columbia. While some of the charities we support do provide relief to those in need, much of what we fund and distribute are ideas – solutions to social, economic, cultural or policy challenges, or investments in building communities across the province. At Vancouver Foundation, I can see the potential and benefits of unlocking our own intellectual property – the things we create and the works that we fund. By making the data sets, research articles, photographs, educational materials and websites that we fund open, shareable and easy to find, we are removing limits to sharing and consuming, ideally creating a benefit that will spread rapidly and easily through our communities and beyond. We have a simple, globally recognized tool to unlock those opportunities. Creative Commons Licenses allow creators to grant other people the right to share, use, and build upon a work that they have created. They are the established global standard, internationally recognized and used on every major content platform from leading Foundations in the US, to Wikipedia, to leading news outlets and even governments. CC licenses have been applied to nearly one billion licensed works in arts, culture, science data, and educational materials, in every country in the world. “This policy is consistent with the institution's aim of wide dissemination of information. We welcome permissions requests and, especially if they are made for non-commercial purposes or for a limited portion of material, we may grant them free of charge.” (emphasis added). To get permission to reproduce material all you need to do is fill out a form, fax/mail it, along with a copy of what you want to reproduce (the irony of this seems to have been lost on the policy makers), tell the agency about yourself, how you intend to use the material etc., and then wait for a response. The Creative Commons license removes all this process and doubt, by stating up front that the material is to be shared, and under what conditions. 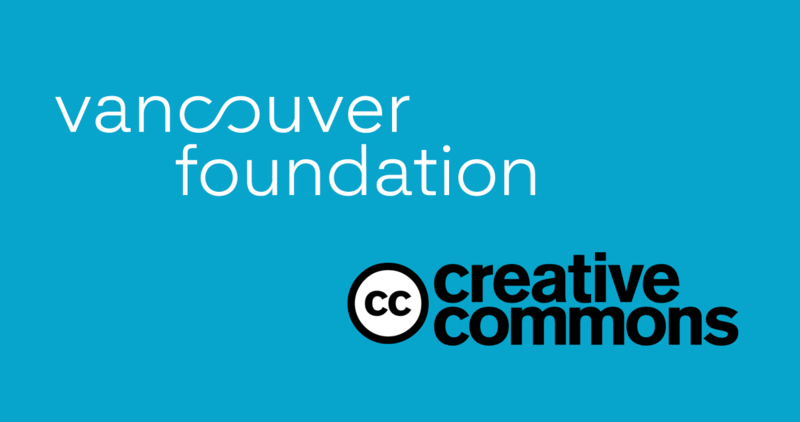 By choosing to adopt a CC driven Open Policy, Vancouver Foundation will create opportunities for innovators and creators to access these works and realize the full potential of the content we create, in ways we’ve never anticipated, and from allies we’ve never met. I am excited to join a growing global movement of public institutions, governments and large foundations forging ahead with Open Policies of their own. This is a big step for us to take as the first Canadian Community Foundation to adopt an Open Licensing Policy, however we know we won’t be working alone. Through our networks of Foundations, we can access support and knowledge from other international organizations who have been developing and implementing their own policies as well. We also look forward to joining together to offer support, tools and resources to other Canadian community foundations as we design our policy throughout 2016. We often say to our donors that one generation plants the seed, and the next generation enjoys the shade; by implementing this open policy we are able to invite our grantees into the circle of giving for the future. CC licenses turn everything a community creates into a seed for something else. They open up the potential for a billion new ideas. Throughout 2016, we will develop a framework and guidelines for our open licensing initiative that is uniquely adapted to the needs of community foundations across Canada. We anticipate that the knowledge and resources developed as a result of adopting this open licensing policy will help other foundations implement their own open licensing policy strategies. We encourage all foundations and interested individuals across Canada to join us on this journey. Join our Open Licensing mailing list! All content from 'Open Policies Unlock Our Full Potential’ by Vancouver Foundation is licensed under a Creative Commons Attribution 4.0 International License except where indicated.